One hot summer’s day a Fox was strolling through an orchard till he came to a bunch of Grapes just ripening on a vine which had been trained over a lofty branch. “Just the things to quench my thirst,” quoth he. Drawing back a few paces, he took a run and a jump, and just missed the bunch. Turning round again with a One, Two, Three, he jumped up, but with no greater success. Again and again he tried after the tempting morsel, but at last had to give it up, and walked away with his nose in the air, saying: “I am sure they are sour. The above story is an example of cognitive dissonance. 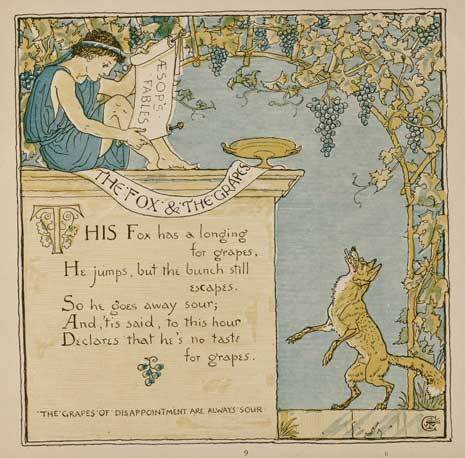 In this case the desire for the grapes and the inability to fulfill that desire causes conflict in the fox. By concluding the grapes must be sour anyway, the fox alleviates the dissonance and merrily goes on his way. This simple principle impacts design and marketing and it’s important to understand what it is and how people alleviate cognitive dissonance when confronted with it. Psychology and sociology impact both design and marketing. Cognitive dissonance is a state of mental discomfort that occurs when a person’s attitudes, thoughts, ideas or beliefs conflict. For example you may believe it’s important to diet in order to lose weight yet have the desire to order cheesecake for dessert. Eating the cheesecake would conflict with your attitude about dieting, which causes discomfort that needs to be resolved. The theory of cognitive dissonances suggests that people are motivated to reduce dissonance by either changing or rationalizing attitudes and beliefs. It makes predictions for how and what we will decide to do as well as how we’ll feel about our decisions after. It is not a perfect and has its strengths and weaknesses. Ho Do People Alleviate Cognitive Dissonance? There are 3 ways in which we alleviate cognitive dissonance. Let’s stick with our cheesecake wanting dieter as an example of cognitive dissonance. Reducing the importance of the dissonance might involve only taking a bite or two. Adding consonant cognitions could be telling yourself you’ll spend an extra few minutes exercising tomorrow. Changing the dissonant cognition could simply be not eating the cheesecake at all removing the dissonance entirely. The incentives associated with a situation influence which of the above methods we’re more likely to choose in order to alleviate the dissonance. 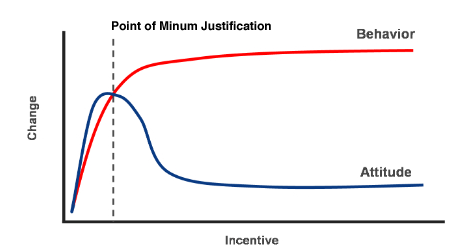 When incentives are small people tend to reduce the conflict by changing beliefs. When the incentives increase people are more likely to hold onto their beliefs and reduce the conflict by justifying that the compensation weighs more than the dissonant feelings. Any incentive beyond a small one therefore reduces the probability that the person will change previously held attitudes. The key in understanding how all this applies to design and marketing is to understand that when faced with cognitive dissonance, people are going to do something to reduce the conflict they feel. The restaurant serving cheesecake might offer a low fat cheesecake (is there such a thing?) or highlight the natural ingredients used in order to lessen the guilt of the dieter. One thing we can do as designers is to lessen the dissonance visitors and customers feel. Creating designs that are in harmony, that stay away from conflicting messages, reduces dissonance. If you make claims that your products are easy to use, but your site is complex and hard to find things, your visitors may reduce dissonance by changing their initial belief that your products are easy to use. Every inconsistency in your design, your copy, your marketing will increase dissonance. You might have heard that it’s a good idea to limit navigation to about 6 or 7 links. Too many choices leads to increased dissonance. The desire to make a decision conflicts with the difficulty to choose from all the possible options. The easiest way to alleviate the conflict might be to not make a decision at all and leave. Cognitive dissonance also implies that initial impressions and branding count. If someone makes a quick decision about your business based on the look of your site you may not be able to change their minds later. Once the belief is held it becomes easier to discredit new information than to change the initial belief. The above is why building a positive brand is so important. Once people hold beliefs about your company the easiest way for them to reduce the dissonance they feel from conflicting messages is to discard the conflicting message. However you can’t rely on this always happening as after enough conflicting messages the easiest way to reduce the conflict is to alter the initial beliefs about your brand. You can even take advantage of cognitive dissonance to create more interesting presentations and power point slides or create interesting bonsai. One way you might use cognitive dissonance is to get people to invest significant time, energy, and participation with something in order to create dissonance then provide a simple and immediate way for them to relieve this dissonance. 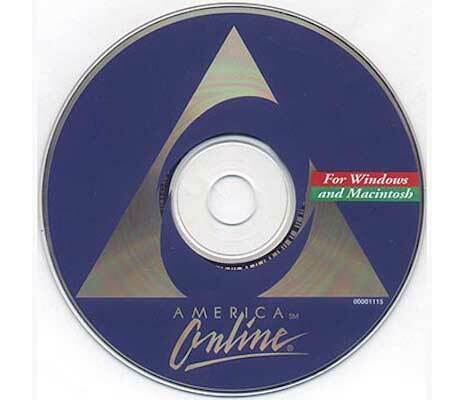 Remember the AOL CDs that came in the mail offering a free trial? In order to get that free trial you had to fill out forms to create an account. There was a good deal of effort in getting that free trial. When the trial period was ready to expire that effort created cognitive dissonance (time already invested vs. spending money), which was easily reduced, by telling yourself it was worth signing up for a subscription. The same can be said of free software downloads. In order to test the product to decide if you want it, you must spend some time and energy learning to use it. When the choice comes to buy all that time and energy makes it easier to justify a purchase. People tend to view themselves in a positive light. Pointing out the disconnect between their self image and the reality of their situation creates dissonance. Advertising does this all the time. The product is the quick and easy solution to alleviate the dissonance the ad creates. One way people might try to avoid cognitive dissonance is to lessen the risk of making a bad purchase. Conflict is caused in buying a product we’re later dissatisfied with. Offering warranties and guarantees reduces the possibility of this future conflict. 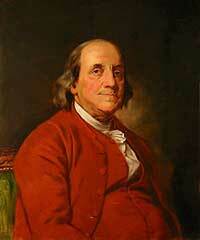 A story Ben Franklin relates in one of his books is of a political adversary Franklin wanted to win over. He asked his adversary if he could borrow a book, a small favor that was easily granted. A few days later Franklin returned the book with a note of thanks. This caused a conflict in the adversary. On the one had he disliked Franklin. On the other hand he had just done him a favor. Franklin’s opponent resolved the conflict by changing his earlier feelings about disliking Franklin. The above is one tactic for persuasion that comes out of cognitive dissonance psychology. If you’ve ever had someone come to your front door trying to sell you something, you’ve likely seen the above in practice. Have you ever noticed how many of those people are carrying clipboards? The clipboard is actually a prop and you’ll always be asked to hold it for a moment. By doing this small favor you are then more likely to grant a larger favor, which is buying what the person is selling. By the way if someone comes to your door and tries to get you to hold their clipboard, don’t take it. The person will usually not make any effort to take it back thereby presenting you with the option of continuing to hold it increasing the length of your conversation or dropping it on the ground which would increase the cognitive dissonance you would likely feel at being rude. Understanding how people psychologically react to conflicting ideas is important when creating a new design or crafting a marketing message. When people feel cognitive dissonance it makes them uncomfortable which increases their motivation to reduce that discomfort. They might reduce the tension by lessening it’s importance, adding new beliefs that help ease the conflict, or changing their initial thoughts. When incentives are motivating the conflict resolution people will usually change beliefs if the incentive are small and hold onto existing beliefs and justify the conflict when the incentive is large. As designers we want to reduce cognitive dissonance visually. As marketers we might make use of this dissonance in order to persuade and influence people. However we also need to recognize that some of the ways in which people reduce conflict will be counter to our goals. Pay attention to the cognitive dissonance that occurs in your life. What caused it? Which of the three methods for resolution did you use to alleviate the conflict? How have people and companies tried to create dissonance for you and did they offer an immediate solution to lessen that dissonance? As a designer do you hold onto bad ideas and rationalize away good ones to reduce dissonance? Asking yourself the above and similar questions will likely result in some enlightening observation about yourself and how companies market to you. A very good article! I’m learning a lot with your blog. The links in the text is a welcome plus.